Daylilies are generally regarded as one of the most versatile perennials for use in landscapes. No other perennial comes in such a wide array of flower colors, shapes, heights, sizes, and bloom seasons. The pallet is filled with beautiful options. Before you get started, here are a few design tips you may want to consider. What are you trying to accomplish? What do you want to see as the finished result? Are you featuring daylilies as the primary attraction? Or will daylilies serve a specific purpose in a mixed perennial planting? Do you need prominent bloom color at a particular time in the growing season? What colors would you like to use? Will they complement one another or provide contrast to other perennials? Does your intended planting area contain significant features such as a pool, fence, or stone wall? Is the planting intended to be admired from a distance or from close up? Are you creating a totally new planting or are you enhancing an existing planting? Does the landscape already provide a backdrop? Will you need daylilies of varying heights? Is your plant acquisition budget adequate to obtain sufficient plants to achieve your intended result? Daylilies are versatile plants that work well when interspersed throughout the garden or used as an edging. They provide a quick and easy way to fill large gaps in the landscape or to fill a hillside. Landscapers often use daylilies in areas they know will need little maintenance but require a big punch of color. Since daylilies will grow in almost any conditions (except full shade), they can be planted almost anywhere with some success. Of course, daylilies planted in full sun and well-drained soil will deliver the best performance. Daylily plantings can be functional, as well as decorative. Massed daylilies are useful ground covers that suppress weeds. They can be used to edge pathways to encourage walkers to remain on the designated paths. They grow well on banks and other areas that are too steep or difficult to mow. Daylilies have even proven effective as fire breaks. 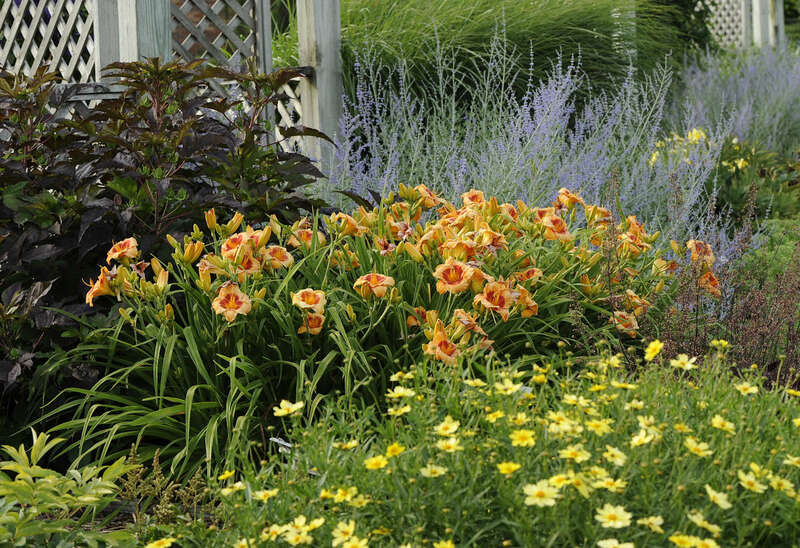 Perhaps the most common use of daylilies is in mixed borders, plantings that may "border" walkways, fences, terraces, pools, lawns, hedges, curb sides, and the like. Such planting beds may be of any shape, formal or informal, and often contain mixed plantings of woody plants, bulbs, perennials, and annuals. Gardeners often like to have something in bloom during most of the growing season and can design such plantings with daylilies that have successive bloom times. Mixed borders are great for accommodating impulse purchases. Gardeners can buy a plant they just can't resist at the garden center and bring it home where it will easily blend in to an open spot in the garden. Their grassy, arching leaves contrast nicely with the foliage textures of other plants and flower colors are diverse enough to fit right in just about anywhere. Daylilies can also be used in foundation plantings. Their foliage blends well with the kinds of shrubs that are typically planted there such as evergreens, rhododendrons, and boxwood. When selecting daylilies for foundation plantings, you might want to be careful about the colors you select. It's a good idea to choose those with flowers that contrast or complement the color of the house. Pink or yellow daylilies would look great up against a house with light blue siding, for example, but bright orange daylilies might look gaudy there. To many prospective purchasers of daylilies, height is often not considered but should be. From a design perspective, it is important to think in advance about how the plants in a bed will appear when viewed from all sides of the bed. Shorter daylilies are best located near the front or edge of a bed. 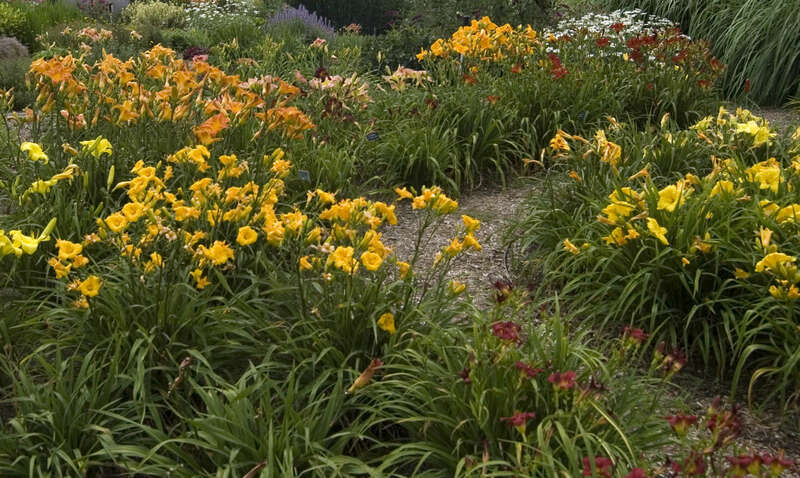 Tall daylilies should be placed in the rear of borders viewed from one side, and near the middle of beds that are viewed from all sides, such as those sited in surrounding lawns. This recommendation may seem obvious, but it is common to encounter inappropriate plant placements even in professionally designed and installed landscapes. Remember that the height given on most plant labels is the height of the plant when in bloom, not the foliage height. When not in bloom, daylilies in containers look remarkably similar. When sited based only on foliage appearance, it is easy to make blunders. One cultivar may make 24" scapes, while others make 36" scapes. Scapes of such widely varying heights may emerge from foliage that looks virtually identical in height. Therefore, pay attention to what the daylily will look like when in bloom. Residents of smaller properties that may have only a deck or small lawn often ignore daylilies, thinking that they would not fit in with their limited gardening space. However, many daylilies look terrific in containers. Try growing a dwarf variety in a container this year even if you live in a condominium with a tiny patio. Garden centers carry all kinds of ornamental containers these days. Look for one that is in balance with the overall size of the daylily you'll be planting in it. 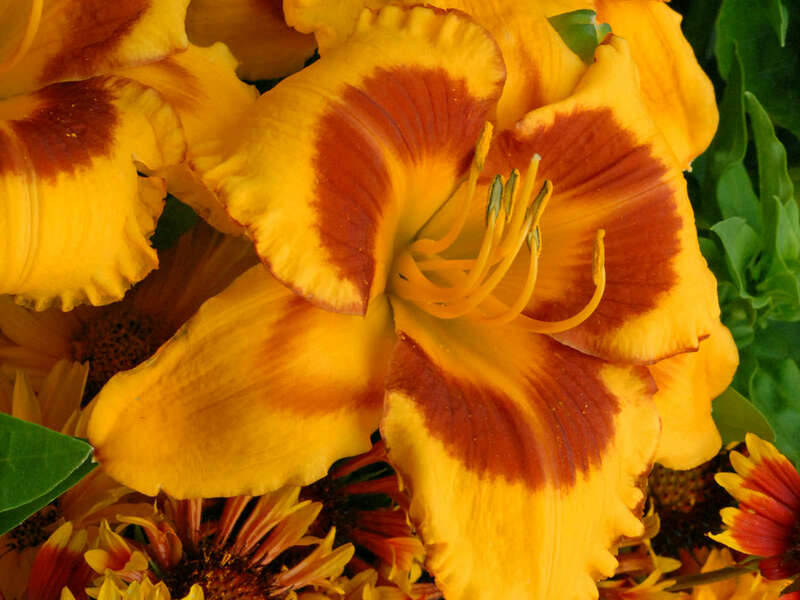 You can create nearly instant positive effect in the summer by selecting an excellent multi-fan daylily specimen in full bud at your local garden center. Plant it in a decorative container and enjoy a month's worth of blossoms, then swap out that plant for a later blooming perennial such as a garden mum when the daylily is finished blooming. Plant the daylily in your garden or give it to a friend with more room for it to grow. Remember to use a light potting mix in your containers. Containers full of normal garden soil are very heavy and difficult to move. Light peat-based potting mixes are readily available in garden centers in easily transportable bags. Such mixes may need nutrients added to sustain your daylily. Some growers use time-release fertilizer pellets such as Osmocote. Such fertilizers are often marketed for roses, but they are equally well-suited for container-grown daylilies. Water soluble fertilizers may also be used. Daylilies of all colors tend to co-exist well as evidenced by collectors' gardens, which are often a hodge-podge of color. However, carefully designed daylily plantings need to take color juxtaposition into consideration. Some color combinations work much better together than do others. A bed of yellow and gold cultivars can be striking when two to ten or more complementary shades are blended randomly in a mass planting. 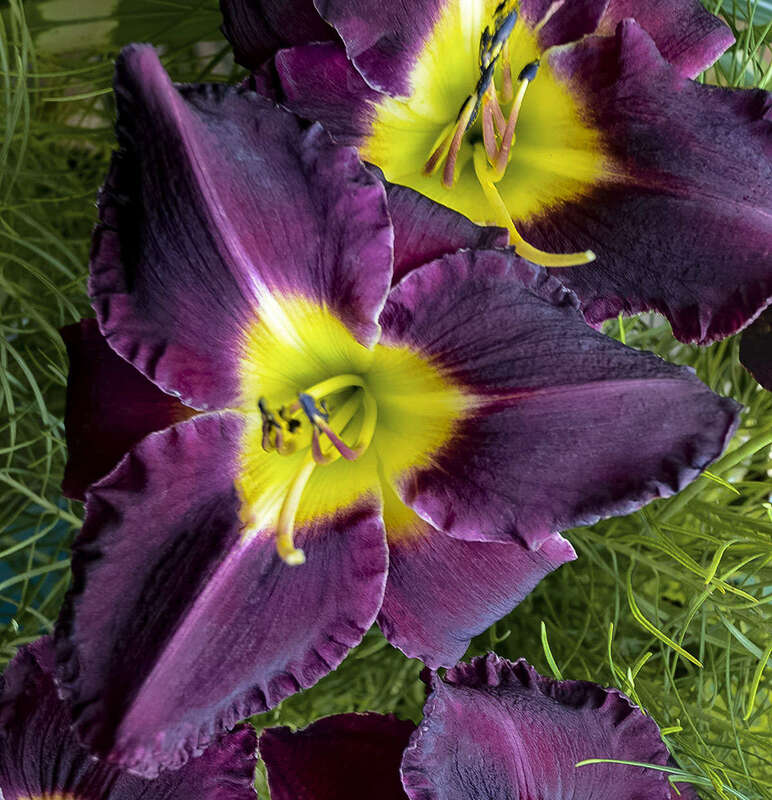 Inserting a yellow daylily with a striking purple eyezone, such as 'El Desperado' can make such a planting even more dramatic. Similarly, dramatically contrasting colors such as deep purple 'Strutter's Ball' or orange and red 'Bold Tiger' work splendidly when interplanted randomly with near-white daylilies, such as 'Sunday Gloves'. Bright yellows also work well, although such sharp contrasts are a matter of personal taste. Though most daylilies coordinate easily with other perennials in the garden, you'll need to be a bit more careful when placing white daylilies near other white flowered perennials. 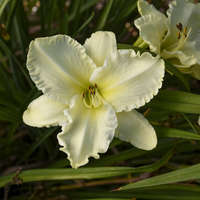 Though daylily breeders have made remarkable progress toward achieving a true white cultivar, even their best achievements are best described as near-white. On the other hand, many other perennials produce true white flowers such as the shasta daisies. For best color effect, it is best to position near-white daylilies next to perennials with flowers in colors other than white. Otherwise, the daylily will look off-white. Daylily breeders have made great progress in improving the quality of daylily foliage. Some cultivars now have foliage that looks presentable in the landscape in their post-bloom period, up to the time when they are damaged by fall freezes. However, in general, post-bloom daylily foliage is not a terrific landscape feature. Other excellent perennials have similar problems. Tall garden phlox and bee balm, for example, have foliage that is less attractive post-bloom. Avoid juxtaposing plants with problem foliage side by side in the mixed border or you will have an aesthetic problem in that area. Instead, use perennials that have foliage that looks terrific during the entire growing season next to daylilies, and you will never notice that the post-bloom daylily foliage is not an asset. For example, fall blooming Japanese anemones and sedums have foliage that looks good all through the growing season. Many perennials attractive foliage as the plants emerge in the spring. Tall-bearded iris, peonies, hosta, and sedum all look good as they make their appearance. Similarly, the newly emerging foliage of dormant daylilies looks fresh and appealing. Individual emerging shoots of dormant daylilies are deep green, symmetrical, and clean. If early spring plant appearance is important in your design scheme, keep in mind what the plants you choose will look like in that season. In northern regions, avoid using evergreen daylilies in any planting scheme where initial spring appearance is important such as in a foundation planting with spring bulbs. The viewer's eye will be drawn away from the beauty of the bulbs to the emerging evergreen daylilies. Evergreen daylilies often look a bit worn in early spring. As they resume their interrupted growth, blunt foliage shoots have to slough off the damaged tips. New growth may be yellowish and the newest leaves emerging from the center of the fan may show some freeze damage. These early spring characteristics are entirely normal for evergreen daylilies and they do not signal that your plants are sick. They will gradually grow out of their "bad hair" period and will look just fine once they have resumed active growth. Hybridizers of daylilies have been able to produce varieties that have a full pallet of flower colors, sizes, and forms. Shapes include triangular, circular, flat, recurved, star-shaped, trumpet-formed, spiders, and difficult to classify informal variants. Slender-segmented spiders on tall, willowy scapes often look quite graceful when placed near the rear of mixed planting beds while daylilies with large blossoms look spectacular when planted in large groups in the middle of the border. 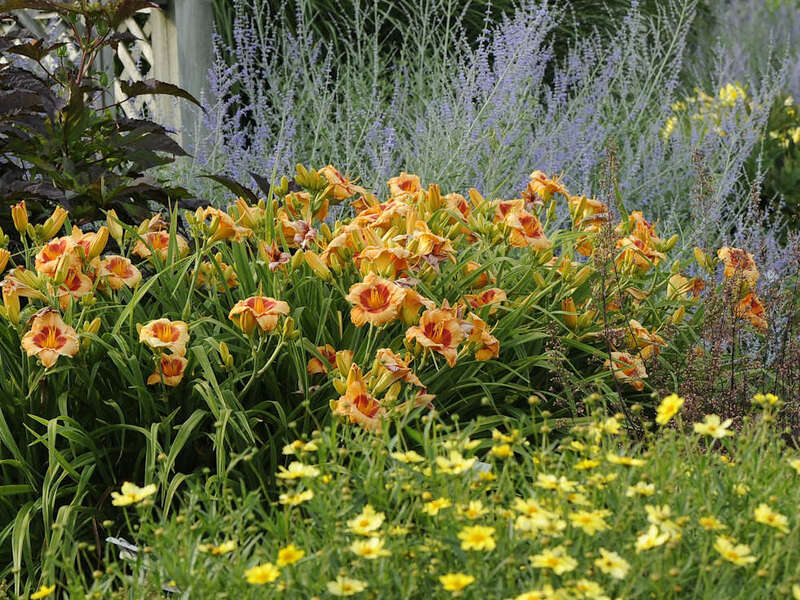 Daylilies with smaller flowers may be best utilized in the front of the border. Unusual blossom features are often appreciated best when viewed close up. Refined ruffling or interesting twists in the petals may be totally irrelevant in mass plantings where color impact is the primary desired effect. However, finely crimped ruffling on a tiny 3 inch flower may look wonderful in a container-grown plant on a deck. That feature might get lost if the same daylily were sited in a bed of mixed perennials. Spring bulbs provide a quick splash of color at a time when it is most needed. Daffodils, crocus, grape hyacinths, and chionodoxa (glory of the snow) make a quick appearance in spring. Their foliage emerges and bloom commences when daylilies are just beginning to reappear. Daffodils, for example, will be in full bloom when daylily foliage is only 4-6" tall. Best of all, spring bulbs do their thing with little effort from the gardener. 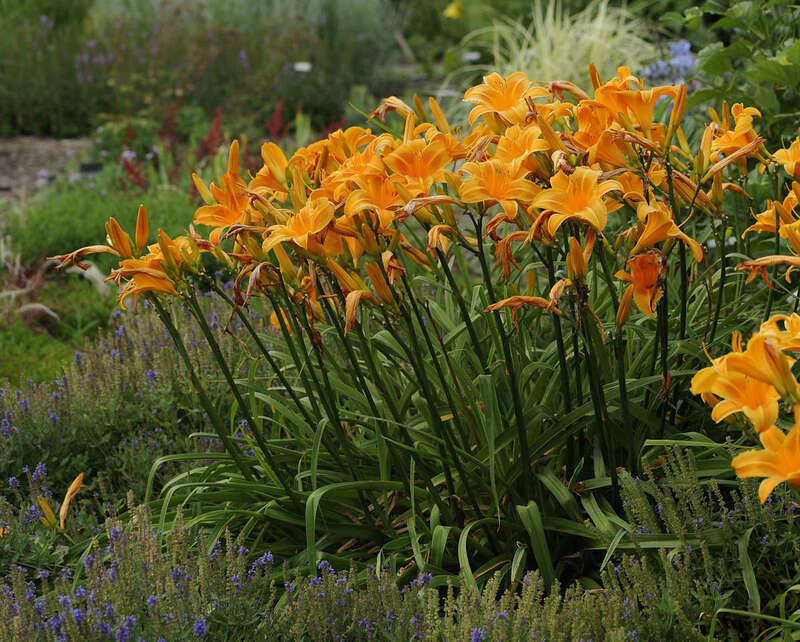 Certain long-lasting, effort-free bulbs coexist beautifully with daylilies. Some daffodils that are described by catalogers as perennializers are well-suited for interplanting with daylilies, usually near the front of mixed planting beds. Daffodils such as 'Ice Follies' and 'Ceylon' make excellent spring bloom, may remain in place for 8-10 years before needing digging and dividing, and are both healthy and vigorous. Daffodil foliage tends to be unattractive in the landscape following bloom. When planted near daylilies, the maturing daylily foliage gradually arches and then covers the deteriorating daffodil foliage, thereby masking the less appealing period of daffodil bloom. Lesser bulbs like chionodoxa, crocus, and grape hyacinth behave the same way, but are much shorter and have to be located a bit closer to the edge of a planting bed. Avoid planting high-maintenance spring bulbs such as tulips and hyacinths around daylilies. Tulips are not persistent from year to year, and fresh bulbs have to be planted annually to achieve a good display. Hyacinths behave similarly. You do not want to be digging out spent tulip bulbs at a time when your daylilies are in active growth. Among the millions of gardeners in our society are groups of plant collectors. There seems to be a plant society for virtually every collectable plant, from African violets to hostas. The American Hemerocallis Society (AHS) has thousands of members, many of whom have sizable collections of daylilies. The garden of a serious collector may look totally unlike anything recommended in books on landscape design. Daylily collectors search far and wide for new and unusual hybrids to add to their collections. Many of these collections are display gardens which are open to the public. The AHS publishes lists of such gardens which are splendid sites to visit to examine first-hand the work of creative hybridizers across the nation. 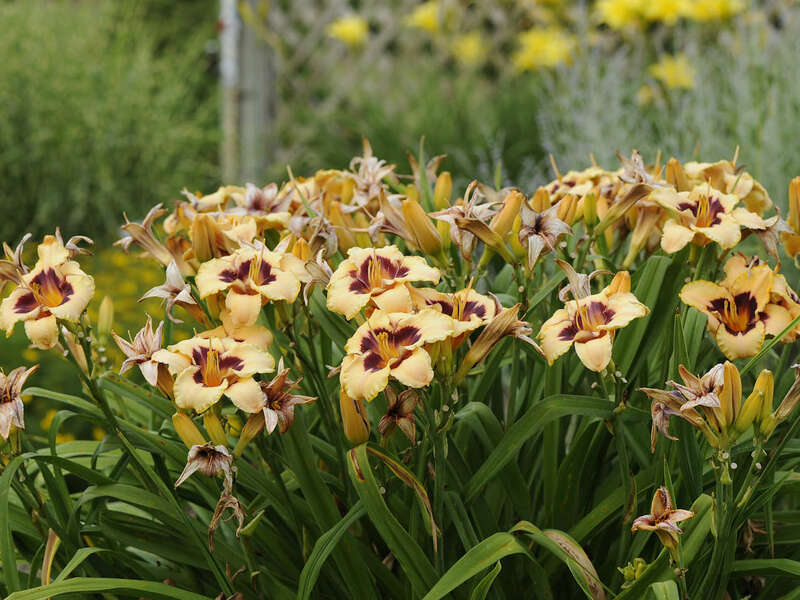 A collector's garden often will have bed after bed of specimen clumps of hundreds of cultivars, carefully labeled with information such as a daylily's registered name, the name of its hybridizer, and its year of introduction. 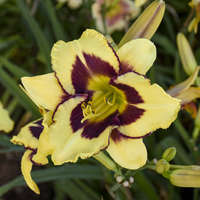 Some collections have daylilies grouped by type such as double, spider, miniature, etc. Sometimes a collector's garden shows little concern for design elements or color juxtaposition. Beds simply contain hundreds of cultivars, usually well-grown and carefully groomed. These gardens serve as living encyclopedias of daylilies. Collectors often trade plants with one another, pay relatively huge sums of money to possess the latest hybrids, and vie with one another at daylily shows for the hottest new varieties. The best way to find such collections and to learn more about the "inside" world of daylily collecting is to join the American Hemerocallis Socity. Be careful-daylilies can be addictive! Most collectors are friendly and eager to convert others to become collectors too. 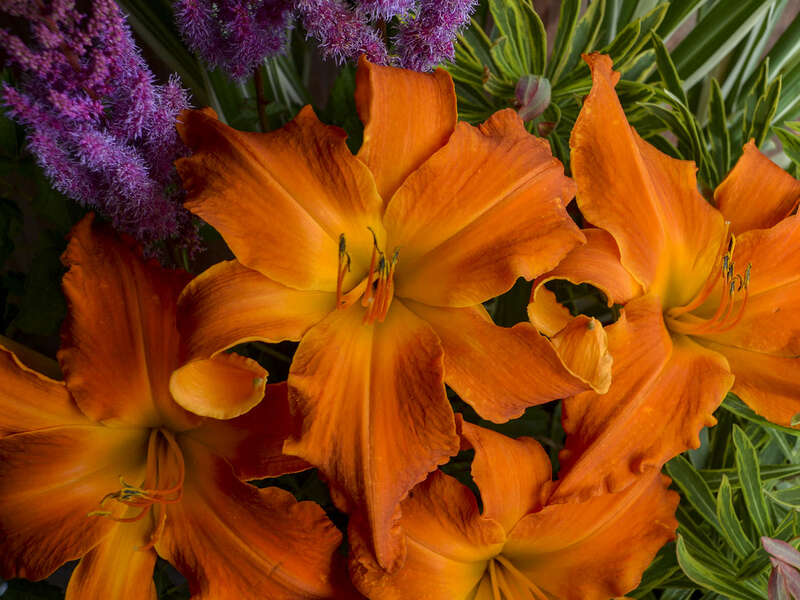 Growing Designer Daylilies™ will give you some insight into just how outstanding modern daylily hybrids are. You may find yourself fascinated enough to want to learn more about this versatile plant. Then you will be well on your way toward becoming an avid collector!